Laura Kenney was born in Moose Jaw, Saskatchewan but her roots are in Nova Scotia and has resided in the province for the past 20 years. She has lived in many towns and cities across Canada as well as Germany and Japan, and it was in Japan where she met her husband, William Morgan. 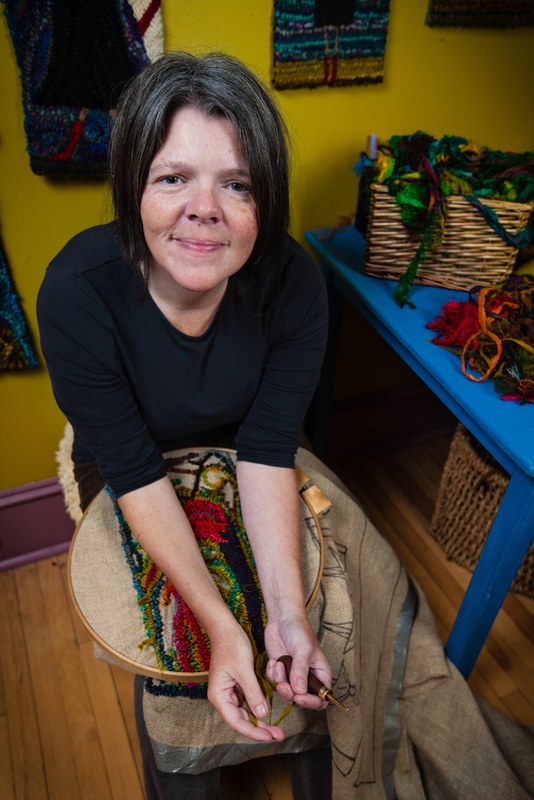 Kenney began rug hooking when she moved to Truro, NS in 1998. She took classes with the Rug Hooking Guild of Nova in Truro which gave her a good basis in rug hooking. Her work has been represented by the Nova Scotia Folk Art Festival since 2009. It was at the festival after talking with the artists and seeing the art, that she realized her humourous, colourful rugs were indeed folk art. Kenney received juried status with the Nova Scotia Craft Council in 2010. Her work “Morning Routine” and “Waiting for the Cat to Let her Out” was purchased by Nova Scotia Art Bank for their permanent collection in 2010 and 2016. Kenney was featured in Rug Hooking magazine in 2013, “The Stories of Laura Kenney” and in the book “Simply Modern” in 2014. In 2016, Kenney had her first solo show at Mary E. Black Gallery in Halifax and a selection of Kenney’s work will be included in “Terroir”, a group show at the Art Gallery of Nova Scotia in 2016-2017. Laura works from her studio in her small green house where she lives with her husband and two children, Jonah and Zoe.